Your bedroom should be the cosiest place in your house and for that reason you must carefully consider what you put there. In order to help you make up your mind, and create a practical room which will look as if it was designed by famous interiors designers, we have prepared a list of items your bedroom absolutely must have. You may think that a themed bedroom is only suitable for children, but this is far from true. We don’t advise you to choose a cartoon one of course, but something more mature. For example, a vintage theme will look classy. In order to achieve this look, you can opt for vintage style curtains, wallpapers and nightstands. These details will be enough to add a touch of uniqueness to your bedroom’s appearance. Aside from the bed, your bedroom must have other furniture as well if you want it to be super-cosy. For example, you can incorporate an ottoman, which will be a perfect additional seat. Aside from this, go for a fashionable nightstand. You can match its design with your bed and make a perfect combination. Not only will it look amazing, but you’ll have plenty of space to place everything you need when you go to sleep, including an interestingly-designed night lamp. Finally, you shouldn’t forget a storage space such as a dresser, but make sure that its size fits the room. Although it’s perfectly okay to stick to the usual pastel nuances, it doesn’t necessarily mean you must do so. Feel free to be bold and experiment with some brighter colours. According to Pantone’s predictions fiery orange and bright yellow, so called Primrose Yellow, will be an absolute hit this year. No matter which colours you choose, it’s important that you create a perfect harmony so that you feel relaxed and peaceful while spending time in this room. A comfortable rug is another thing which will, together with your curtains, bed sheets and wall colours, contribute to creating harmony in your room. 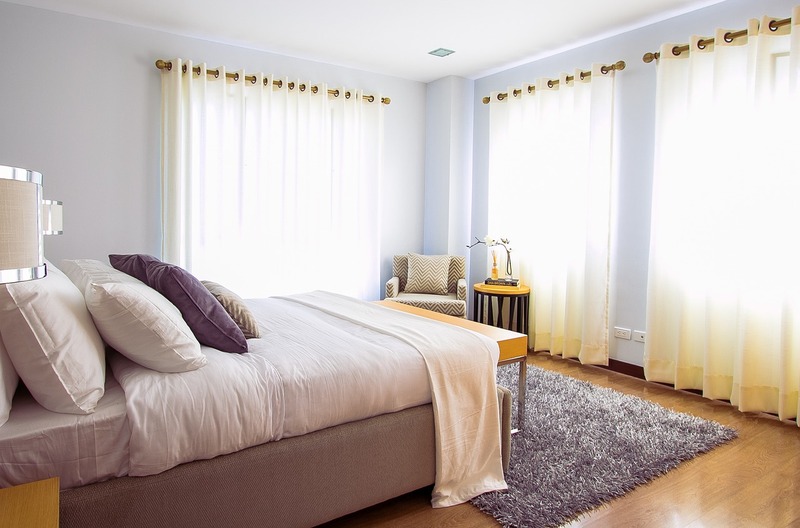 Not only will your bedroom look complete and nicely put together, but you’ll be elated to step on a soft warm rug early in the morning, instead of a cold floor. There are many different rug designs, so choose the one that matches the rest of your bedroom interior. As in every other room, having appropriate lighting is extremely important. Aside from a bedside lamp, you can incorporate string lights as well. Pinecone shaped ones are both practical, and can serve as decoration. They’re especially suitable for romantic evenings with your partner, since nothing can set the mood as successfully as dimmed lights. Additionally, you can light scented candles to make the evening truly magical. So far, we’ve talked about what your bedroom must have, but let’s mention what it really doesn’t need – technology. Since your bedroom should be a place where you relax and enjoy peaceful moments alone or with your partner, technology can only interrupt this piece and destroy the essence of this place. So, if you have a TV in your bedroom, it’s time to move it to another room. This way, when you go to sleep there will be nothing keeping you up. The same goes for your smart phone. Instead of carrying it in bed with you, leave it in your living room and experience true serenity. As you can see, you can easily be your own professional interior designer. You just need to consider what is practical, and make sure to follow your wishes and decorate according to your own taste.